If you’re familiar with thrift stores, dollar stores, and used bookstores, this idea combines parts of all three concepts. Basically, this is a used bookstore, but with an enormous competitive advantage. All of the books you’re selling are donated. Thus your cost of inventory is zero dollars. That makes the charge of a dollar ($1) a great mark-up for you and an unbelievable bargain for the avid reader. This idea will take some investment - or some donated fixtures and retail space - but the potential may be worth the risk. You will need a storefront, as well as racks for displaying the books properly. Even though you’re providing a tremendous bargain at a $1 per book, your bookstore needs to duplicate the shopping experience of a traditional bookstore. People will want to find books and authors quickly, so you need to provide them with some of the same categories that you see when you visit a Borders or a Barnes and Nobel bookstore. And don’t forget to get your state and local reseller license to collect sales taxes, if applicable. As you start to collect paperbacks and higher-end books of the photo journal variety, you might want to consider a more tiered pricing model. Perhaps charge 50 cents for paperbacks, $1 for hardcover books, and $2 for higher-end books. You might even want to take in magazines, displaying the most recent issue in front, and back issues behind. You should even consider creating a new book sales area by buying from the world’s largest book wholesaler, www.IngramBook.com. They even supply Amazon. And there are many more. These will go at premium prices when compared to the above. You should also consider selling online through MissionFish, Amazon’s marketplace, and www.Half.com – eBay’s marketplace. 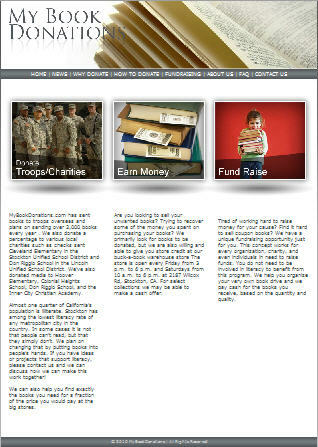 See “Selling Donated Books Online” for more ideas that can be combined with your physical store. Source of Idea: Used bookstores, dollar stores, and thrift stores are in wide use today. This idea has been discussed by The Orphan Foundation board for several years, but has never been implemented at the time of this writing. We recently found a similar concept operating in Stockton, CA: http://fatcitybookspictures.com/sbs/index.html.